Last week I updated my backyard gazebo, with a little help from Goodwill, of course! I purchased new cushions for my patio furniture from Lowes along with three different colors of coordinating spray paint, then I went to Goodwill to search for some items to give my gazebo a fresh new look. First, I added a large green drape as the backdrop and accented with white and blue curtains on each side. The blue “curtains” are actually flat sheets since I couldn’t find blue curtains in the drapery section. These curtains are on the north side of the gazebo and will get just a bit of direct sunlight but not enough to completely fade them. I love adding curtains to my gazebo because not only do they give shelter from the hot Arizona sun but they also add a bit of coziness and color to the space, not to mention they hide a block wall behind them. I’ve got plenty of Goodwill finds from my gazebo to share so stay tuned. 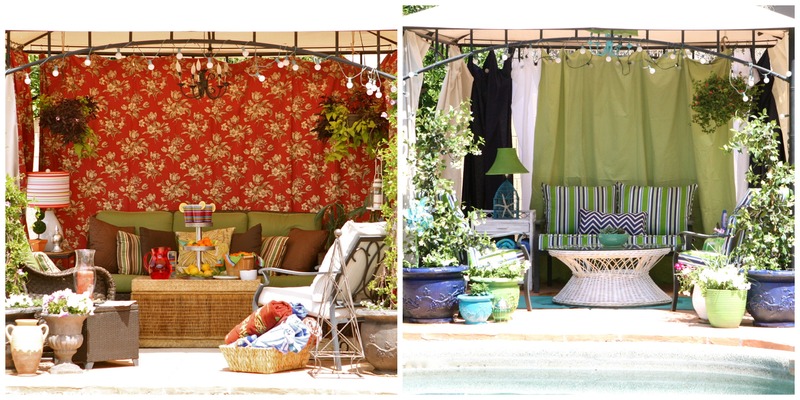 In the mean time, which look do you like better, last season’s gazebo or the new one? How do canvas drop cloths work in the Arizona sun? Here in Northwest Arkansas, I have to hang them a bit short to avoid mold or mildew or both. Alternatively, I could wash them each and every single week. Nah, hang them short it is. Yes, hang them short! Mold, mildew, dirt, bugs and everything else with decide to live in the hem. ha ha Thanks for stopping in.